We appreciate your feedback about your support experience with SomewhereWarm, developers of Conditional Shipping and Payments. This helps us maintain high standards on the WooMarketplace, and helps SomewhereWarm improve. 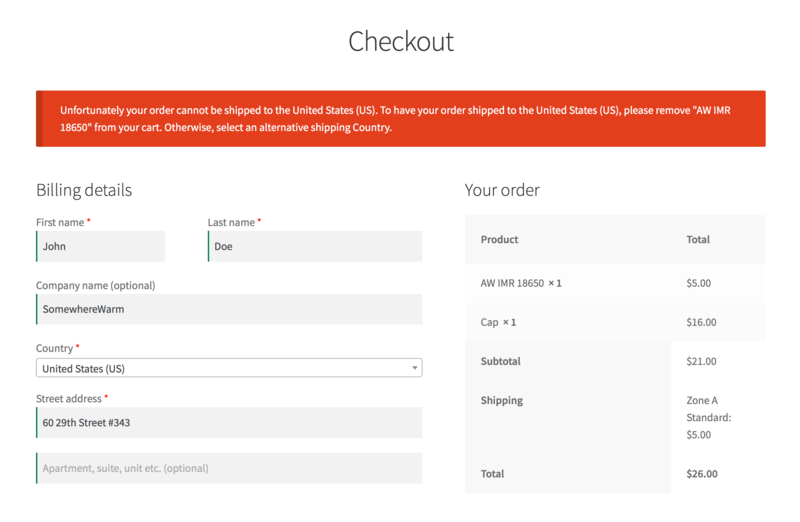 Use conditional logic to control the payment and shipping options available at checkout. 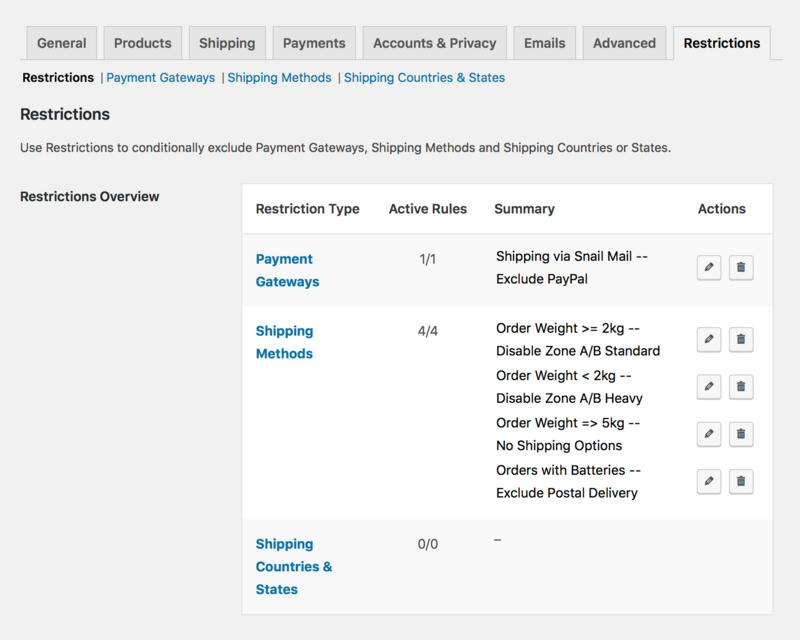 Conditional Shipping and Payments gives you full control over the Payment Gateways, Shipping Methods and Shipping Countries/States on your site. Ensure that products with special handling requirements are always delivered with the right shipping method. Ship valuable orders via insured, trackable shipping methods only. Grant or limit shipping method and payment gateway access to specific customer groups, such as Membership holders or wholesale customers. Limit the offered payment method options when purchasing certain types of products, such as Subscriptions. Prevent specific categories of products from being shipped to countries with restrictive customs import regulations. For specific products, product categories or shipping classes. Based on package weight or shipment value. When a coupon is activated. For individual customers, customer roles or Membership holders. Depending on gateway availability in different billing countries. For specific shipping methods, or shipping countries/states/postcodes. Depending on the products, product categories or shipping classes in the cart. For individual customers or customer roles. For customers with an active Membership on your site. 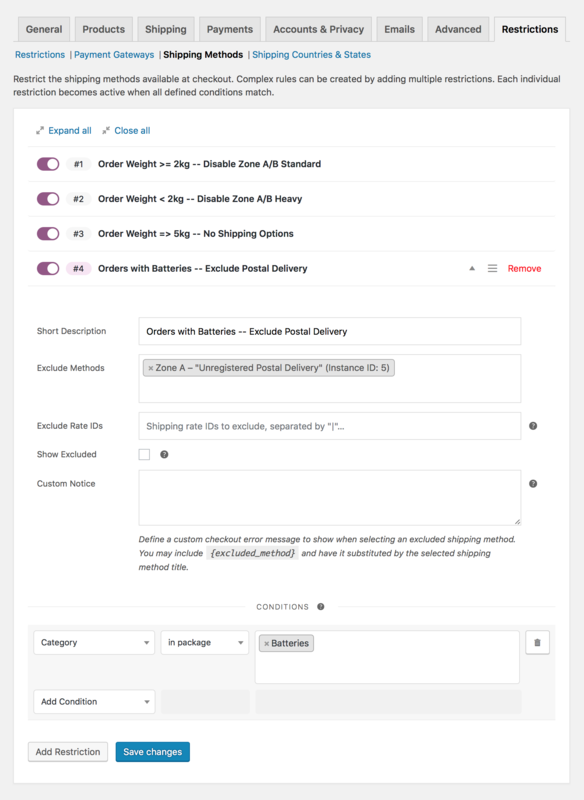 Product categories or shipping classes in the cart. Cart or shipping package totals. Customer e-mails, roles or Memberships. Want to learn more? Check out the documentation for a complete list of all conditions available in the extension. Struggling with scattered snippets? It’s never too late to streamline the way you manage your shipping and payment rules. To help you integrate restrictions into your workflow, Conditional Shipping and Payments allows you to create both global and product-level restrictions. No matter which approach you choose, the extension lets you easily manage all active rules on your site. Running a high-traffic site? The extension leverages all caching optimizations built into WooCommerce and loads only the components needed to evaluate the rules you’ve built. This ensures that Conditional Shipping and Payments will never slow you down. Care about code quality? Every feature we’ve built into the extension is automatically tested in real-world conditions every time we add new code. We’ve written over 2000 tests to ensure that your focus is always kept on what matters the most to you: Your business — not your plugins! Conditional Shipping and Payments already comes with more than 8 integrations with popular extensions, such as Subscriptions and Memberships — and the list keeps growing! Need to build a custom condition? 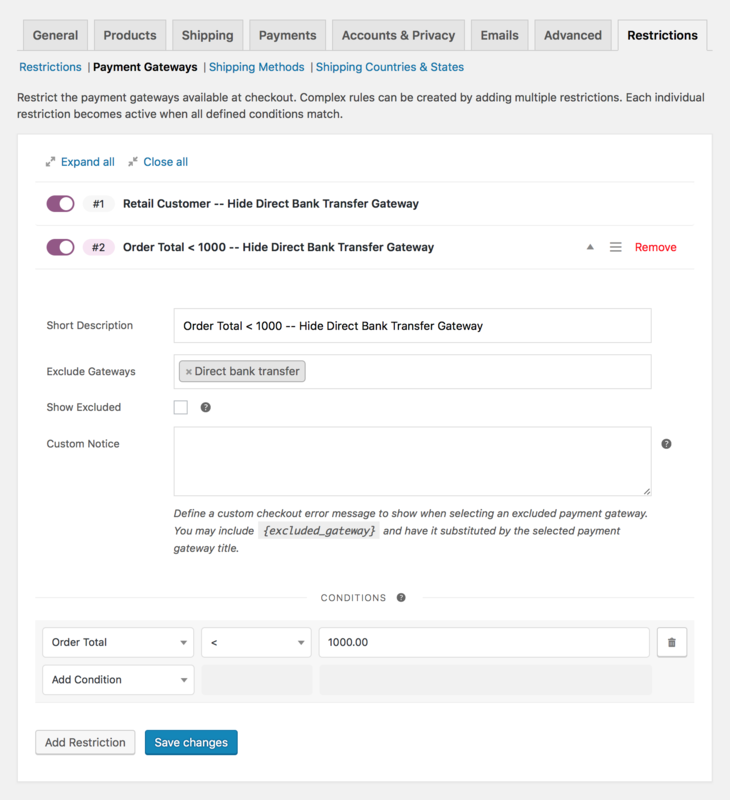 Use actions and filters to add new conditions, customize the extension, or even build new types of cart/checkout restrictions from scratch. We ship out from multiple locations, and had issue when the code was updated that would not let us conditionally select shipping type per the products. This fixed the issue very well faster than support could get back to us as for a fix as why suddenly the old system did not work. We’ll gladly support a plugin that will make sure we consistently have the proper system in place instead of unexpected changes! My E-commerce site could not function without this plugin. It's simple yet powerful. If you really think about it pretty much any shipping issue can be solved with this plugin. This extension is gold for our market. Try hard coding all of this stuff? No thanks. This plugin makes it as easy can be. AND support is solid. Very solid. Thanks guys! Not sure how to improve it, I had no issues. The support is great. We had custom code and they took the time to look at our code and provide meaningful feedback. The issue, at the end, was caused by our custom code, but the support engineer was very polite and helped us all the way. We currently use this product to help restrict payment options for customers in the Continental US and those that are outside that zone. This allows us to essentially sell to EVERYONE, but also alleviates any customer issues they may face if they were given the incorrect Payment/Shipping options. This is important because Continental US customers get Free Shipping with their order and any customer outside the Continental US (which includes Alaska and Hawaii) need to be sent an estimate for shipping, however the order still needs to be taken before payment is processed (to include the shipping estimate). This is where the plugin comes in and provides the appropriate Payment (PayPal/Credit Card) and Shipping (Free Shipping) options to Continental US residents versus any customer outside the Continental US, which then gives them the appropriate Shipping (Shipping Estimate needed) and Payment options (takes order but does not require payment). We would not be able to have such a customer-friendly checkout experience for our business without the use of this amazing plugin! Our only issue was that there was no way to set a default Payment/Shipping option without having to set a default Country/State as a majority of the customer-base is in the US; this led to problems when we did set a default state as some customers did not change their State from the default one causing issues with taxes and extended management of each order. Being that the only way to restrict the Payment/Shipping options would be to set a default Country/State, we needed a solution that hid the incorrect options for Continental US residents as those customers specifically get Free Shipping where anywhere outside the zone, a shipping estimate has to be manually generated. HOWEVER, the support team at SomewhereWarm worked with us directly to develop a solution that worked for us and potentially any other Woocommerce customer that may face issues with Continental US shipping. At this point, I believe the plugin works 100% for what we need it to! The quick and effective support! I cannot think of any specific improvement at this time. Plugin gives many options. Exceeds where WooCommerce doesn't. A little tricky to get the conditional logic right, but their team was very helpful. Give multiple scenarios and how to set the logic up accordingly so that users don’t have to contact customer support. Customer support is fantastic! I had some questions about getting it set up correctly and they provided fantastic, quick replies to each one of my questions! Also, the plugin functioned exactly how I needed it to. Highly recommended!! Works great already. Can’t think of anything. It does not need anything! Very useful plugin. I’ll rate it 5 stars when “is not” option will be available on “shipping method”.